CoCoRaHS is a unique, non-profit, community-based network of volunteers of all ages and backgrounds working together to measure and map precipitation. Last week persistent torrential rain fell over the Texas Hill Country north and northwest of San Antonio/Austin causing record and near-record flooding on rivers and lakes in the area. 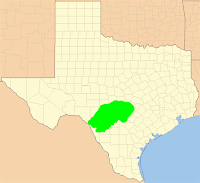 This area is particularly susceptible to flash flooding and is known as Flash Flood Alley. It wasn't just the amount of rain, but the rainfall rates that helped cause the problems this week, as well as a record wet September. The heaviest rain fell between October 14 and October 16, with lighter rain the remainder of the week. In those three days more than a foot of rain fell in the Hill Country, with 7 to 10 inches of the rain falling in the 24-hours ending at 7:00 a.m. on October 16. The CoCoRaHS stations shown below in Llano and Mason Counties tallied the highest totals during the three-day period and for the week. The persistent rain last week over Hill Country and central Texas was caused by what is called an "overrunning" pattern. 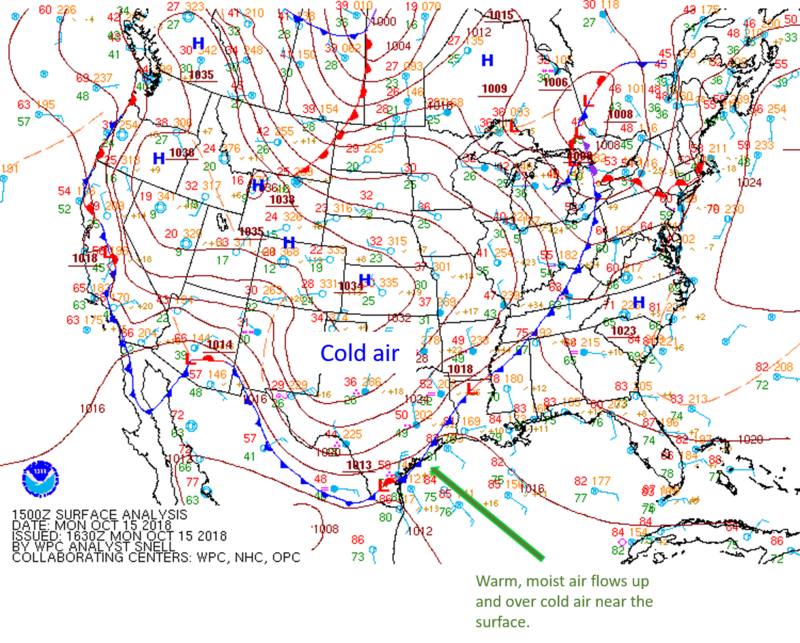 In this case a cold front, marking the leading edge of a large cold air mass that spread across the western two-thirds of the U.S., lie along the Texas coast. Warm, moisture-laden air from the Gulf rode up and over the dense, cold air in the lower layers of the atmosphere producing clouds and rain. In addition, several waves of low pressure moved along this frontal boundary enhancing the upward motion and the flow of air from the Gulf. Surface weather map for Monday, October 15 at 10:00 a.m. CDT. 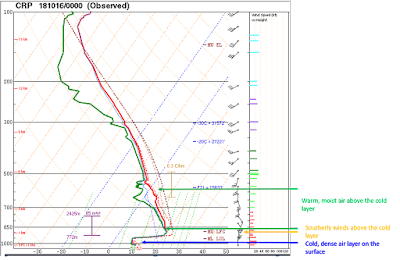 Here is the upper air sounding from Corpus Christi, TX the evening of October 15. You can see the cold layer of air near the surface and northerly winds, and the southerly winds aloft along with the warmer, saturated air. During the winter an overrunning setup like this could produce significant freezing rain. 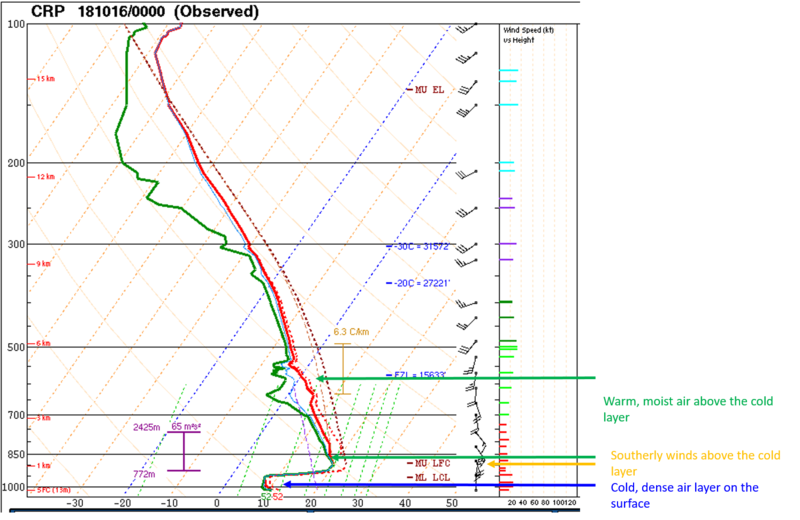 Atmospheric sounding plot (Skew-T) for Corpus Christie, TX at 7:00 p.m. CDT October 15. The solid red line is the temperature plot, the solid green line is the dew point. A wet September and rain earlier in October meant that any rain last week was going to run off into the rivers and streams. The rise on rivers in the Hill Country was spectacular, rising 10 feet or more in just a few hours. 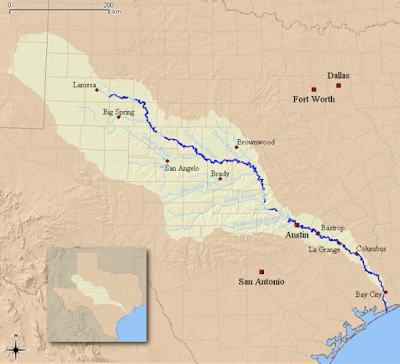 These tributaries eventually feed into the Colorado River (the Texas Colorado River, not the Colorado River). The Colorado River flows southeast through a series of lakes used for flood control and recreation (Buchanan, Inks, LBJ, Marble Falls, Travis, and Austin) and eventually to the Gulf of Mexico. Watershed of the Texas Colorado River. Many of the tributaries to the Colorado River quickly flooded, with all of the water feeding into the Colorado River. The Llano River at Llano came close to setting a new record flood level but fell just short of the record of 41.5 feet set on June 14, 1935. Flood stage is 10 feet. The flooding washed out a highway bridge over the Llano River outside Kingsland, TX on Tuesday, October 16. Here is video of the bridge washing out. Damage to homes and other infrastructure was extensive. Hydrographs for rivers in Hill Country during the flooding, compiled by NWS San Antonio/Austin. Lakes Buchanan, Inks, LBJ, Marble Falls and Travis were closed to recreational use last week and were expected to remain closed until at least until today. On Monday, a boil order was issued by Austin Water for all of its more than one million customers due to elevated levels of silt from the flooding. The boil order is expected to be in effect until at least Sunday. This week the remnants of Hurricane Willa, which made landfall on the west coast of Mexico on Tuesday, interacted with an upper level trough moving through central Texas triggering additional rain yesterday. The heaviest amounts fell between Galveston and Houston where 2 to more than 5 inches fell. Much of the Dallas/Fort Worth metroplex received 1 to 3 inches of rain. 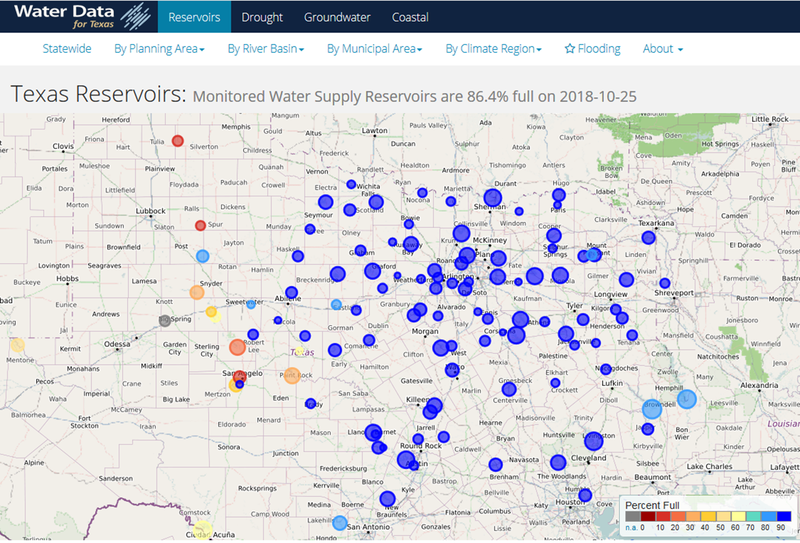 Most reservoirs in central Texas are now near or over capacity. 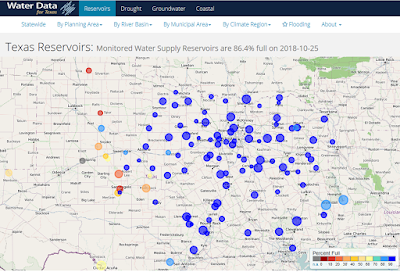 Texas reservoir status as of October 25, 2018. Rain is still needed in west Texas and in the panhandle, but much of the state could use a break for a while. Precipitation is much above normal since September 1, more than 20 inches above normal in some places.